Mittens Writes: Let's Play a Game, how about, which finger is the band-aid on? Answer: All of them! Let's Play a Game, how about, which finger is the band-aid on? Answer: All of them! Well, well, well. It's been a very interesting couple of days. I was going to start with the most telling moment and make this post all clever and sophisticated by then "flashing back" to all the correspondingly nit-witty moments of the last few days, but I'm all out of clever. The First Bad Thing: Our living room TV crapped out for no discernible reason. Lulu was watching Spongebob one minute, and nothing the next. We tried for about six hours to figure out what was wrong with it before we finally gave up and brought out Ye Olde TeeVee from Lulu's room, and put the newer, albeit dead, unit on the floor. The 20-year-old tv has a bizarrely blurry picture, but then again, I think I was just used to looking at HD. The 10-year-old, yet dead, tv wasn't HD, but it was more than 10 years younger than the ancient beast we're using until we buy a new one. It's amazing what 10 years of technological advancement means in a TV. Okay. I was upset about having to shell out a few hundred bucks for a tv this week, but I was getting used to the idea. Then last night Helper Monkey was leaving for work, and came back a minute later. His "Check Engine" light was on, and he wanted to take my truck to work. Fine. I know he needed a tune up, and I even knew why his check engine light was on. I'd been putting off tuning his Jeep for a month or so, but I knew last night I couldn't wait any longer. 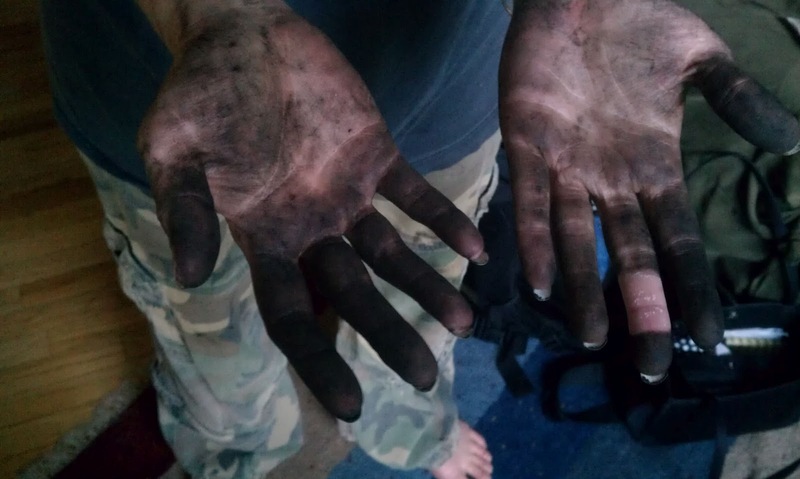 I'm not fond of mechanic work, but I'm competent. I just don't like to get that greasy. So this morning, I loaded Lulu into the Jeep, and we headed off to the auto parts shop. Sidebar for a moment here: Tomorrow is Father's Day, just in case y'all forgot. I have to work the baseball game (which inexplicably, I just typed as "basebally game"). We'd been planning to order pizza tonight, and Helper Monkey proclaimed his desire to have a beer with his pizza. I figured I'd kill two birds with one stone and get beer while I was out getting auto parts. Helper Monkey was unaware that I'd severely depleted our beer stockpile over the last week or so, and I couldn't have him disappointed on Makeshift Father's Day. We also needed to make a stop at Dairy Queen, because that's how I managed to bribe Lulu into coming out with me. So we went into the store, bought spark plugs and wires, but I couldn't convince the guy working there that the Jeep did, indeed, require two PCV valves, so I have to go back and finish the job another day. I didn't feel like standing there arguing with him, though, so I took my purchases and headed off for alcohol. I bought a case of Guinness Black Lager for the Helper Monkey, swung by Dairy Queen (which I keep wanting to spell "Diary Queen"), and we headed home. 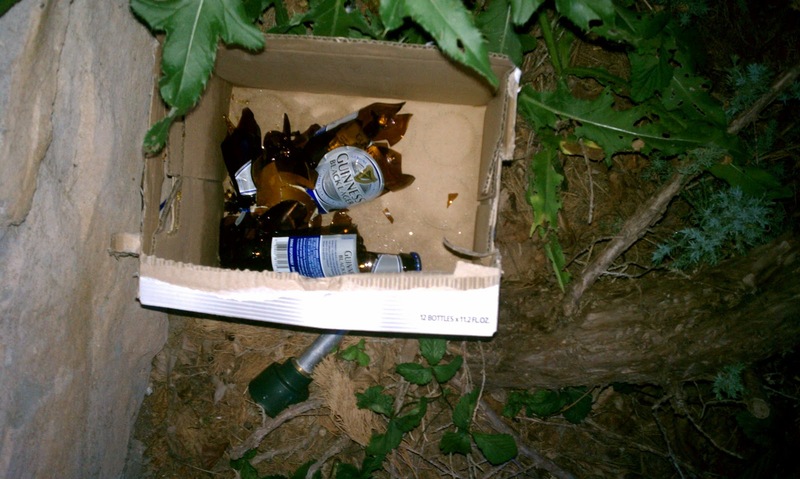 My hands were full of auto parts and beer, while I trudged toward the garage refrigerator to deposit the bottles. I got the fridge door open, and then the handle on the case ripped and the smashing commenced. I nearly cried. All that Nectar of the Gods, gushing out onto the concrete! Forsooth! Luckily, only two bottles of the 12 smashed. Still. Sad. Even worse: Trying to rip the box apart to salvage what I could before the entire garage flooded with Guinness, I ripped open my finger on one of the broken bottles. I didn't even realize I was bleeding until I got into the house and couldn't figure out why my hand was still wet. Oh, and this morning, I cut a different finger on a can I was rinsing out for the recycling. So I have matching gashes on each hand. Okay, so I came inside to let the engine cool down enough to work on, and we ordered pizza. The pizza was great! Every story needs a little break in the tension, after all. Pizza makes for a great break. STET. After dinner, I headed out to do the tune-up. It should take about 40 minutes. It SHOULD take about 40 minutes, but I'm a ninny. 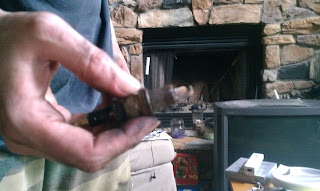 I got 5 of the 6 plugs and wires replaced, but the last one just WOULD NOT COME OUT!!! I cursed the Chrysler corporation for putting the last spark plug right up against the alternator. What ding dongs.....oh. Right. I have a wrench attachment to go around corners that fixes that problem. Which I only remembered after ten minutes of wrench wrestling, cursing, wailing, and grumpiness. Still, Chrysler put the battery in the way of replacing the right headlight. You actually have to remove the battery to change the wee tiny light bulb. Ding dongs. So I feel justified in cursing them, even though I had an easier solution to my current problem at hand. The Jeep runs like a dream now. I have a picture that I only realized the true magnitude of when I looked at it later. I wanted to send my step-father a picture of the offending spark plug that caused the fault, but the defunct TV is on the floor in the background. I am the queen of Defunct Things. When I was done, I was informed I needed to wash up before I was allowed to touch anything. Before I started work, I put a band-aid on my owie finger. Can you guess which finger that was? Hint: It's the one that looks different. So that ended up being the Helper Monkey's father's day. He gets a like-new car (with 218,000 miles on it), pizza, beer, and a frazzled, injured wifey. Oddly, it works out for us. Now I hope the people at the ball game tomorrow night don't think my hands are still dirty when I serve them beer. It's 100% impossible to remove All The Grease in one day. If only I could write this many words on my WIP today! That would be a true miracle. But seeing as how the Helper Monkey will be up in about 15 minutes, and it's his first day of vacation, I figure I should hang out with him tonight. For those unfamiliar with #B22K, this is the creation of Lindsay Smith. She explains it on her blog here. The idea is that you find time for writing every day. That you make time for writing every day, and set goals. In this case, the goal is 2k words. I started off the challenge with the best of intentions and the worst timing. I keep swearing to get more written every day, and then the fates conspire against me with finger injuries, car maintenance, and smashy beer. I WILL write more. Dang it. Just not tonight. I need a nap now. But hey, you have beer now! And writing is slow going. Summertime blues, apparently. And it's a vacation week for us, so we're trying to do family stuff, which means even less writing. And the saga herein is truly a tragedy in three parts . . . So sorry about your fingers and the beer! I'll raise a Hefeweizen in your honor tonight. Thanks! I'm climbing back into my writing chair right now for some quality #b22k time. As soon as I finish catching up with bloggity things. Can you come and do my car? Nissan QX? Hope you have a great week to replace the bad one. Martin, I'd be happy to work on your car. You need a tune up? You within 20 miles of New Market, Maryland?